Donald Trump, the billionaire business mogul who has enjoyed the top spot atop the Republican polls in New Hampshire, urged his supporters to come out for him in Tuesday's primary. Trump held a rally Sunday afternoon at Plymouth State University in Holderness. "If you're not going to vote for me, do not vote," Trump told the large crowd gathered in a university athletics center. Not everyone at the rally had their minds made up about how they will vote Tuesday. Nancy McIver of Holderness said she will vote Republican, but is still checking out all the candidates, especially Trump and his opponents who have served as governors. "Here it is, Sunday, and I have to vote on Tuesday, and I still don't know," McIver said, noting the economy and how to care for veterans and the elderly are of prime interest to her. "I'm running out of time - I've got to make up my mind!" McIver's husband, Jeff, said he is strongly leaning toward Trump, but noted he did want to first check out the candidate's temperament in person, to gauge how well he may hold up in a general election. "There's going to be an onslaught of negativity if Mr. Trump is the nominee, I believe, thrown at him," Jeff McIver said. "And he has to prove, to me anyway, that he has a way of dealing with that without losing his temper and prove to the American people that he's a leader." Two other rally attendees, who described themselves as being "95 percent" and "99 percent" leaning toward Trump, said they had some concerns about the way the candidate, known for his bluntness and sometimes politically incorrect remarks, may treat others if he is the Republican party's nominee. 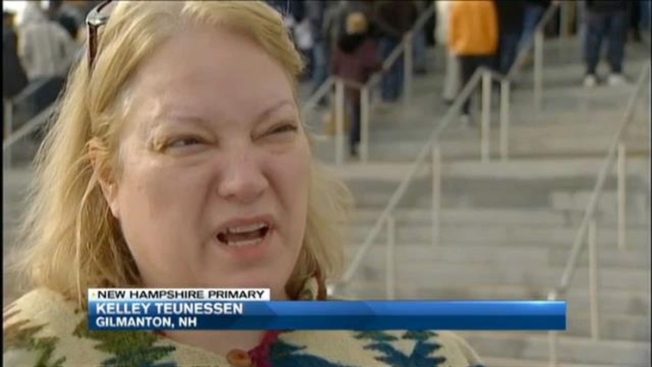 "He's not very thick-skinned, so I'm a bit worried about that," said Susan Peoples of Salem. "But I do like all his ideas." "It's the way he words things to people - he might need to tone it down," Kelley Teunessen of Gilmanton told necn, adding she likes Jeb Bush, but was drawn to Trump because he is not a career politician. At one point during the rally, a shirtless protestor calling Trump "racist," in reference to the candidate's call on a temporary ban on Muslims who want to move to the U.S. from foreign countries, was escorted from the venue. While security removed the man, who had "Trump is racist" written on his body, Trump supporters loudly chanted the candidate's name. Outside, another Trump protestor, Plymouth State student Hannah Dutton, said the candidate's presence on campus did not reflect her values or those of many other students. "I will not be voting for Donald Trump, that is for sure," Dutton told necn. "I do not support his America." In his energetic speech, Trump claimed victory in Saturday night's Republican debate on ABC, and said he is the candidate who can be tough with foreign leaders while addressing issues at home like growing jobs and stemming the flow of heroin from Mexico into the United States. Furthermore, Trump promised his supporters in Holderness that because his campaign is largely self-funded, he is not beholden to special interest groups or wealthy donors, so will not always side with influential lobbies. "I don't need your money; I need your vote," Trump told the crowd at the rally.